Life's Journey To Perfection: 2017 Sharing Time Ideas for November Week 4: I can prepare now to serve a full-time mission. 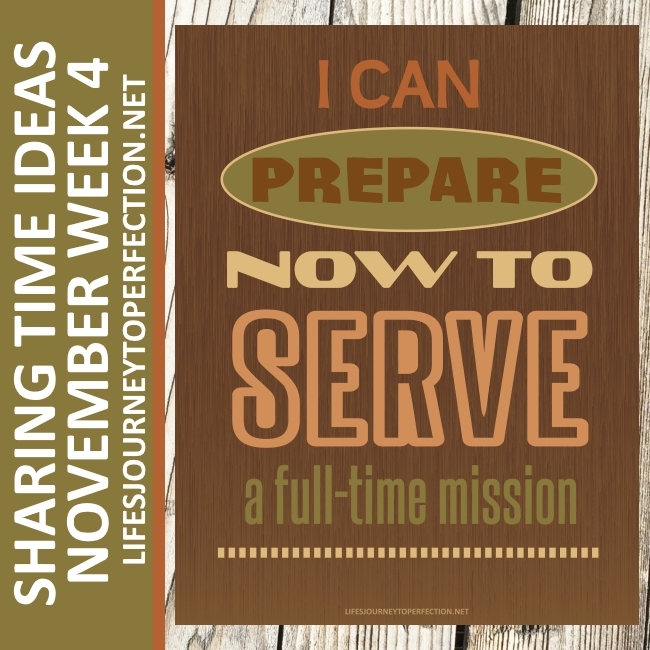 2017 Sharing Time Ideas for November Week 4: I can prepare now to serve a full-time mission. November 2017 Scripture: “And he said unto them, Go ye into all the world, and preach the gospel to every creature” (Mark 16:15). November Week 4 Topic: I can prepare now to serve a full-time mission. Begin Sharing Time by inviting the primary children to sing the song, "I Hope They Call Me on a Mission"
Show the primary children a suitcase. 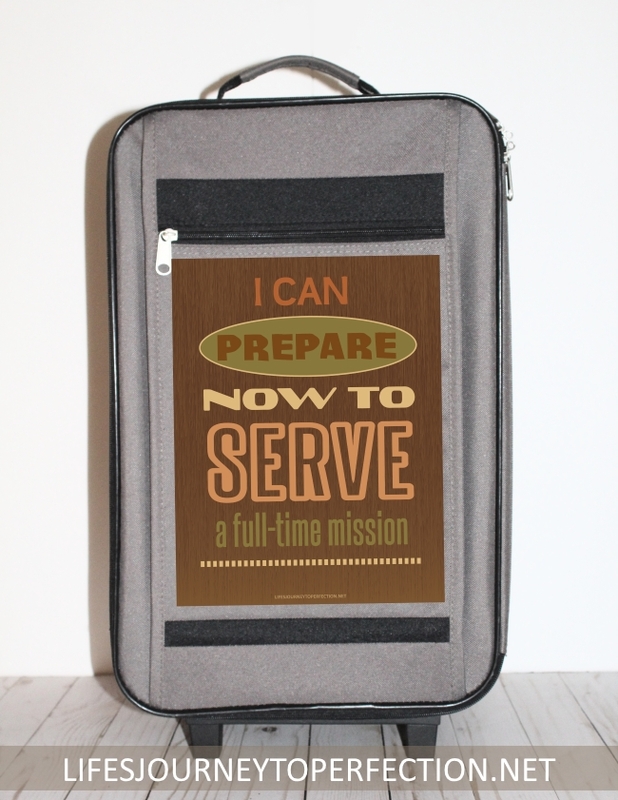 On the outside of the suitcase have the week's theme poster and invite them to repeat, "I can prepare now to serve a full-time mission"
Explain that we can be missionaries right now as we are examples and share the gospel with our friends. We can also prepare now, to serve full-time missions when we are older. 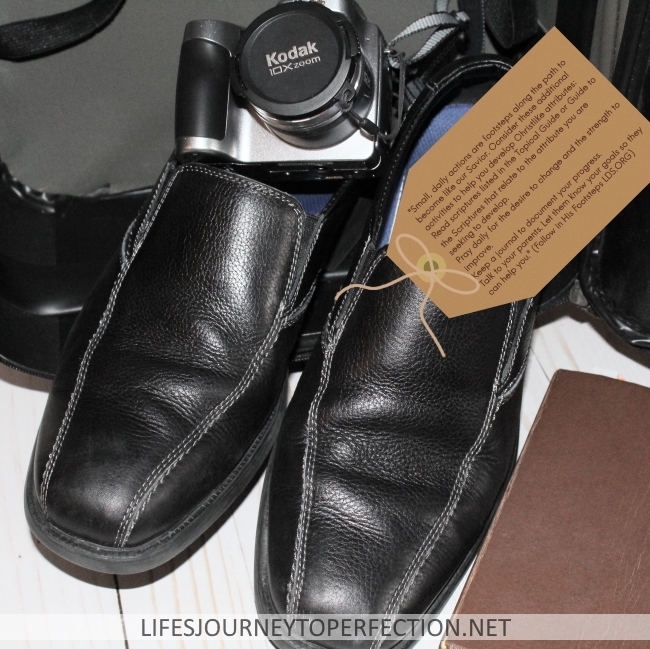 Explain that in the suitcase are things that can help us prepare to be a full-time missionary. Invite a primary child to come up and pick an item out of the suitcase. Read the quote that is on the item and discuss how it can help us prepare to serve a mission. Close by sharing your testimony on preparing right now to serve a mission and the importance of sharing our testimonies with others. Read scriptures listed in the Topical Guide or Guide to the Scriptures that relate to the attri­bute you are seeking to develop. Pray daily for the desire to change and the strength to improve. Camera: Picture ways you can be a missionary now. "You don’t have to travel to a different country, dress in church clothes, or wear a name tag to be a missionary. Journal: "The Lord and His prophets have emphasized the importance of keeping records. Writing in a personal journal gives us an opportunity to reflect on our lives and recognize the many blessings God has given us. Our journals can also be a source of inspiration and strength to future generations of our families." (Come Follow Me) As we prepare to serve a mission we can reflect on those things we've written in our journals. CTR ring: "One of our greatest responsibilities, and yet privileges, is the right to make choices." (Henry D. Taylor) Choosing the right daily will help prepare us to serve full-time missions. Preach My Gospel: "You don’t have to wait for your mission to start using Preach My Gospel." (Learning Teaching and Preaching the Gospel) Learn about the Savior and the gospel so you will be able to teach about them. Study Preach My Gospel with your family. 2017 Sharing Time Ideas for November Week 1: I can be a missionary by serving others. 2017 Sharing Time Ideas for November Week 2: I can be a missionary by setting a good example. 2017 Sharing Time Ideas for November Week 3: I can teach my friends about Jesus Christ and His Church. 2016 LDS Sharing Time Ideas for September Week 4: I can be a missionary now. October Primary Sharing Time Week# 2- Living the Gospel helps me to be a Missionary now. 2016 LDS Sharing Time Ideas for September Week 3: I can prepare now to serve a mission. LDS Sharing Time Ideas for November 2015 Week 3: When I serve my family, I serve God. LDS Sharing Time September 2014 Week 2: By giving service to others, I give service to God. Relief Society: Simple Service Ideas that Even Kids Can Do! LDS Sharing Time Ideas for November 2015 Week 4: When I serve my neighbors, I serve God. Thank you for your time and ideas! I use your site every month when it's my turn for sharing time! I REALLY appreciate your time & energy!